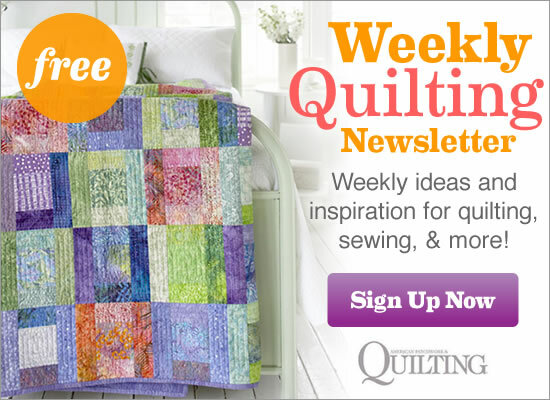 See the featured quilts and web-exclusive color options and projects from the American Patchwork & Quilting October 2013 issue. The October 2013 issue of American Patchwork & Quilting is on sale from August 6--October 7. Designer and author Tula Pink creates distinctive fabrics and patterns with a perfect blend of new and old--a modern twist on a traditional quilting foundation. See Tula Pink's website here. An appliqué center surrounded with Churn Dash blocks and a stunning border uses a simple machine technique that mimics the look of hand appliqué. Use a variety of vibrant batiks and fusible appliqué to make the center section of Garden Medallion. A cool blue background offsets the red and orange in the appliqués and blocks. Twist and turn strip-pieced segments for an a-maze-ing quilt inspired by an antique version. Get the coloring diagram and optional size chart. This wall hanging may look confusing but it’s not. It’s simply strip set segments arranged in a mazelike pattern. Draw upon a split complement color combination (two neighboring colors each on the opposite sides of the color wheel) like this red/orange and green/blue combo. A black inner border makes the quilt center stand out. Add off-kilter strips one at a time to craft a bewitching jack-o'-lantern and coordinating Shadow Box blocks from favorite Halloween novelty prints. Fun fall prints and wonky pieced blocks make up a whimsical autumn wall hanging. A pumpkin block in assorted oranges pops off the quilt for a bright seasonal design. Tiny Square-in-a-Square units look like perfectly manicured olive-green fields viewed from above. Natural greens are highlighted with rich red sashing in a doll quilt that can span the seasons. Square-in-a-aquare units form a grid shape that echoes the geometric shapes in the rest of the quilt. Form a jagged chevron look across a bright fat-quarter-friendly throw by offsetting blocks that are a variation of Delectable Mountains. Turn Peaks & Valleys on its side to create serrated-edge lanterns. Use a variety of bright batiks in combination with dark blue tonal batiks for contrast that wows. The background is a combination of three different dark blue batiks, adding subtle detail you notice only a second look. Resembling stepping-stones along a path, sparkling Mariner's Compass blocks are framed with Pineapple blocks that shade from gold to burgundy. We'll lead you through the techniques involved: fussy-cutting, set-in-seams, and mitered borders. Sometimes fabric choices are inspired by shapes in a quilt design, as was the case here. Spiky points on the Mariner's Compass blocks repeat the tepee motif of the novelty print fabric. Look closely: There really aren't Churn Dash blocks in this quilt. It's the intersections of the asymmetrical block that create the appearance of Churn Dashes. Cute novelty prints and soft pastels make this a perfect baby quilt! A directional banner print was carefully cut so it always is waving in the same direction. Cute in many colors (we've shown three), here's a crib quilt you can piece in no time. Adding gray neutrals to the typical white neutral updates the palette. Green and red always look great together. A bit of pink keeps the finished wall hanging from looking too much like Christmas while a standout bird print adds a fresh touch. Take an alternate route to reach a classic Drunkard's Path block. Choose one of two applique techniques, neither of which required curved piecing. The Drunkard’s Path blocks in this wall hanging form undulating diamonds that are both curved and jagged. Tone-on-tone prints allow ample space for beautiful quilting.